Champions in this category are individuals or organizations who, or that have demonstrated the ability to deliver results in digitizing a facet of their manufacturing operations or the operations of another manufacturing company (more detailed Champions features can be found in the 2018 Champions Yearbook). Baltimore County’s Lion Brothers has been transformed into an international leader in the design, fabrication, and sales of a wide range of identity and branding products across a range of markets after more than 100 years of conventional manufacturing of embroidered products. Baltimore County’s Direct Dimensions is a world leading 3D scanning firm, led by Founder and CEO Michael Raphael. He has pioneered methods and solutions for 3D scanning, working across multiple industries. 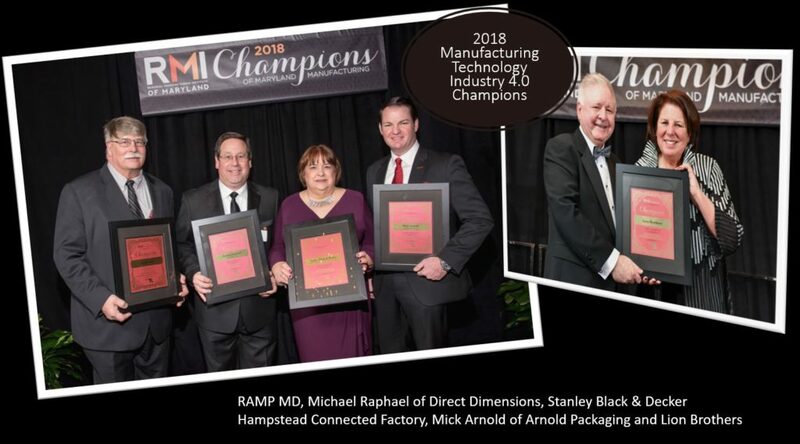 Baltimore County’s Arnold Packaging, led by its president Mick Arnold, specializes in cutting-edge packaging solutions for commercial and industrial customers including state-of-the-art packaging automation equipment for processing and applying advanced tracking technologies. Harford County’s Regional Additive Manufacturing Partnership of Maryland (RAMPMD) organization benefits both government and industry, promoting the research and development of advanced processes of joining materials to make objects from 3D model data. Carroll County’s Stanley Black & Decker’s Hampstead Connected Factory Manufacturing facility has been a pilot plant for their Industry 4.0 initiative as pioneers for testing and validating systems that will eventually be scaled across the organization globally.